In 1982, a Turkish sponge diver stumbled upon what he described as ‘metal biscuits with ears’ off the Mediterranean coast of Turkey near Kaş. The find proved to be an elite shipment from the Late Bronze Age, providing precious archaeological evidence for the exotic and valuable gifts exchanged by kings, heads of state, or wealthy merchants. 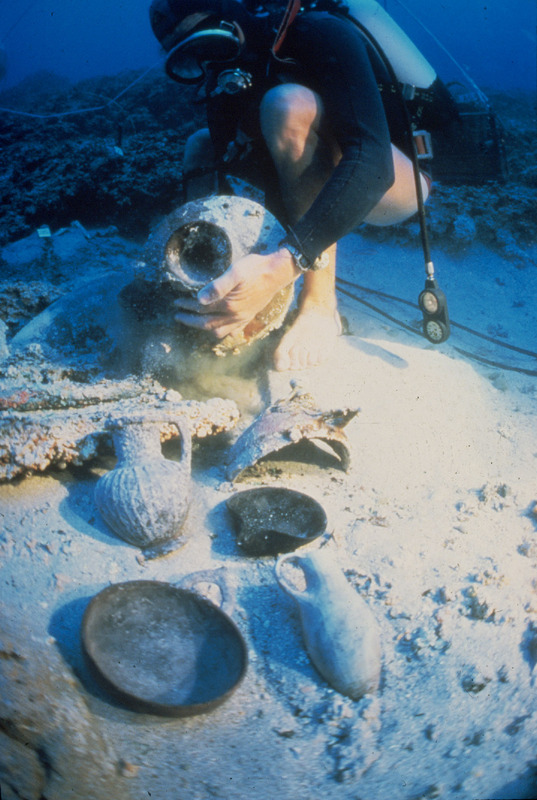 The Uluburun shipwreck was excavated by INA over 11 seasons between 1984 and 1994, with more than 22,000 dives logged to depths in excess of 150 feet. The Uluburun ship was transporting a bulk cargo of copper and tin ingots, in the usual ratio of 10:1 to produce bronze. Other cargo included pottery (used, unused, and also containing foodstuffs) and luxury items intended for a very specific and wealthy audience, such as carved ivory containers, jewelry of gold and semi-precious stones such as carnelian and agate. Raw materials from distant lands included glass ingots, unworked elephant tusks, ostrich eggshells, and faience beads. Personal effects such as weapons and galley wares, balance weights and musical instruments including lutes with tortoise-shell sound boxes suggest that the ship was operated by a Syro-Canaanite crew and carried several passengers from the Greek mainland. In addition to the precious cargo, many stone anchors and a tiny bit of the hull remained, both of which are equally important in the study of ancient shipbuilding and its development. The ship itself was built of Lebanese cedar, wood that was prized in antiquity, with the technique of pegged mortise-and-tenon joints, and possessed a proto-keel rather than a true keel. Close study of the cargo and hull remains of the Uluburun wreck has provided a special glimpse into the Bronze Age, its material cultures, and aspects of construction, economic exchange, and transportation. In general, this degree of interconnection of the Mediterranean during this time could have only been achieved through the intense maritime activity that is exemplified by the ship that sank at Uluburun. C. Pulak. 1988. “The Bronze Age Shipwreck at Ulu Burun, Turkey: 1985 Campaign.” American Journal of Archaeology 92:1-37. G.F. Bass, C. Pulak, D. Collon, and J. Weinstein. 1989. 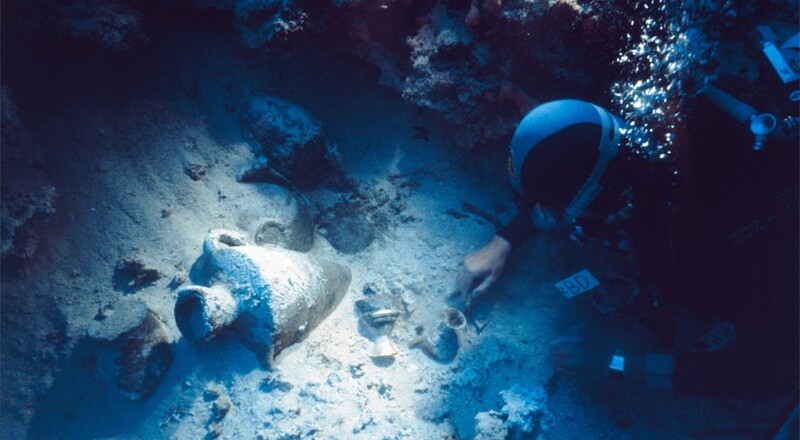 “The Bronze Age Shipwreck at Ulu Burun: 1986 Campaign.” American Journal of Archaeology 93:1-29. C. Pulak. 1998. “The Uluburun Shipwreck: An Overview.” International Journal of Nautical Archaeology 27:188-224. C. Pulak. 2000. “The Balance Weights from the Late Bronze Age Shipwreck at Uluburun.” In Metals Make the World Go Round edited by C. Pare, 247-6. Oxford: Oxbow. C. Pulak. 2001. “Evidence from the Uluburun Shipwreck for Cypriot Trade with the Aegean and Beyond.” In Italy and Cyprus in Antiquity, 1500-450 BCE edited by L. Bonfante and V. Karageorghis, 13-60. Nicosia, Cyprus: Costakis and Leto Severis Found. C. Pulak. 2002. “The Uluburun Hull Remains,” In Tropis VII. Proceedings of the 7th International Symposium on Ship Construction in Antiquity edited by H.E. Tzalas, 615-36. Athens: The Pierides Foundation of Cyprus and Greece. Jackson, C. M., and P. T. Nicholson. 2010. “The Provenance of Some Glass Ingots from the Uluburun Shipwreck.” Journal of Archaeological Science 37:295-301. Manning, S., C. Pulak, B. Kromer, S.Taiamo, C. Ramsey and M. Dee. 2009. “Absolute Age of the Uluburun Shipwreck: A Key Late Bronze Age Time–Capsule for the East Mediterranean.” In Tree-rings, Kings, and Old World Archaeology and Environment edited by S. Manning and M. Bruce, 163-188. Oxford: Oxbow Books. 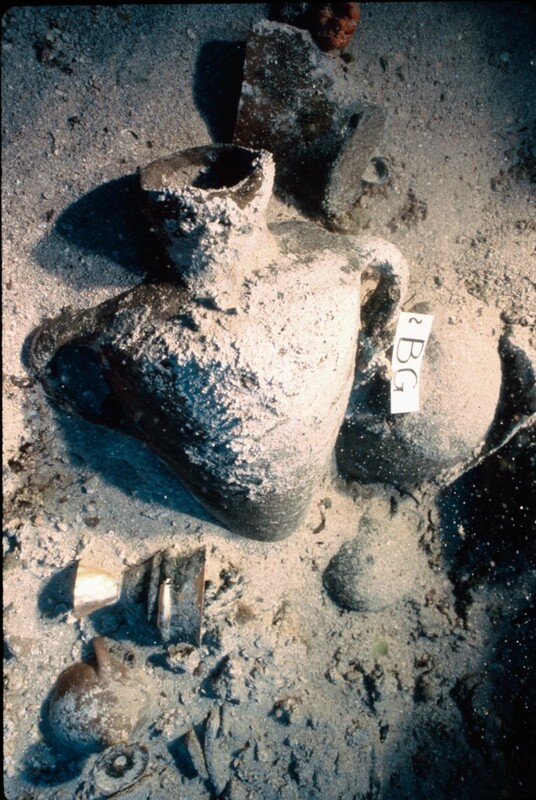 ABOVE: Amphora and large gold chalice with a pedestal base in situ (Left Photo: INA Slide # KW-1805). Amphora being removed from the seabed after careful recording (Right Photo: INA Slide # KW-1194).